Introducing our Skin Base Mixer, a tool that can create an entirely new shade or adapt yours to perfection. Skin Base Mixers are the ultimate fix to increase brightness or to add warmth and depth to the skin. They also cleverly adapt to conceal and correct blemishes and colourations that are sometimes concerns for mid to deeper skin tones. Skin Base Mixers are also a handy essential to adapt your foundation shade throughout the seasons. To lift your skin tone and add instant brightness, a few drops of “White” mixed into your usual Skin Base Foundation or used alone underneath is your point of call. To reduce redness and balance an uneven olive skin tone, mix some “Amber” with your Skin Base Foundation. To add warmth, “Terracotta” will blur any unwanted dark pigmentation – aim to apply around the eyes, mouth and hairline. “Chestnut” is your go to mixer if you want to add further depth or alternatively create a chiseled under-contoured finish. I use this to contour, blends so nice. Even nice as a lip colour. 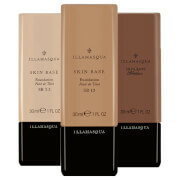 Perfect for contour and to make foundation darker, it lasts all day!! Never received the item. It was sent back to UK. Never received a 100% refund. Would like a full refund. Great for highlighting and for lightening up foundation in the winter months. You only need a little bit and it goes a long way. Don't think i've ever managed to match my skin tone to a foundation as well before (pale, yellow based) thanks to this product. Literally could not live without this product! Mix a few drops with your foundation base to use as a contour!